Senior PA official accuses Hamas of trying to make political gain from leading the "March of the Return". 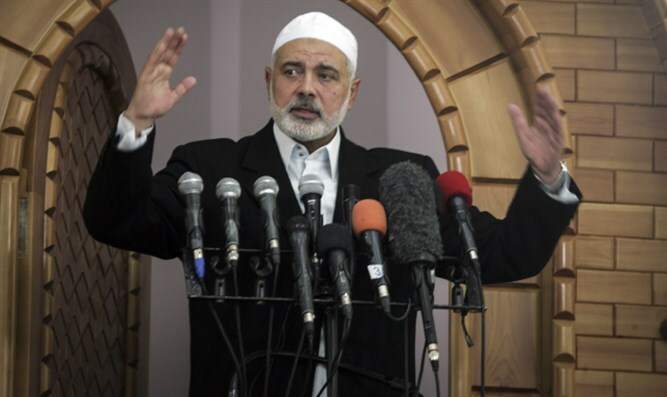 The Palestinian Authority (PA) government in Ramallah on Tuesday accused Hamas leader Ismail Haniyeh of continuing the policy of division and distancing from national unity while trying to mobilize the masses for his needs. PA government spokesman Yusuf al-Mahmoud demanded that the Hamas movement renounce the use of slogans and language that deepen the split in the Palestinian camp in order to facilitate national reconciliation. The path to national reconciliation, said Mahmoud, begins by allowing the PA government to exercise its authority in Gaza, and does not go through Haniyeh, who seeks to exploit the activities of the Palestinian public in order to deepen the existing split. The comments come amid continuing tensions between PA chairman Mahmoud Abbas’s Fatah movement and Hamas. The two groups, which have been feuding ever since, signed a reconciliation agreement in October, as part of which Hamas was to transfer power in Gaza by December 1. That deadline was initially put back by 10 days and then appeared to have been cancelled altogether after it reportedly hit “obstacles”. Following the collapse of the agreement, Hamas several weeks ago implemented new checks on Palestinian Arabs seeking to leave Gaza. Mahmoud's remarks express the PA’s position which perceives Hamas as trying to gain political capital from the so-called “March of the Return” processions in a way that establishes Hamas as the leader of the Palestinian people at the expense of the PA.